Today was a bit of a strange day. I am normally off from work on Thursdays. But when I started my “new” work arrangement with my company, one of their conditions was that I would/could be flexible if push came to shove, particularly supporting client projects. So of course I granted them that wish. After all, this is management consulting, and flexibility to meet your client need is an absolute minimum requirement for the job. So, I worked today since I had a client meeting scheduled for today. But, Hubby had a meeting at 7:45 AM, and I had a conference call at 8:30 AM, which complicated things a bit… I would be on my own for all drop offs and we also had to leave earlier so I could be back in time for my conference call…. Older kids were up and excited to get dressed by themselves, since their piles were already out and they were looking for positive reinforcement. 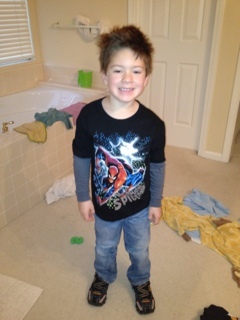 Big Bro was excited to wear a new spiderman shirt I got him yesterday. We were talking about the need for everyone to be ready to leave early, and for Big Bro to have his backpack ready (as an example). The next thing we knew, Twin Husky came walking into the kitchen dragging Big Bro’s backpack and using all of his body strength to lift it up and hand it over to Big Bro to help. That was just so cute I couldn’t stand it. Honestly, the rest of the morning was a bit of a blur. I can’t think of anything else that stood out…there were the diaper changes, the lunches to pack, the shoes to put on, the jackets to put on, loading the kids in the car….. I did all the drop offs; Red first, then Twins, then Big Bro. I made it back home with 10 minutes to spare to prepare for my conference call. I re-filled my coffee mug and booted up my computer. I had the conference call and got some good feedback from one of the participants of the forum that we are trying to sell a membership to. He liked the forum but their business may not be big enough to be relevant for the group. I would not take “no” for an answer so I invited him again as a guest for the next meeting in April in hopes that he wants to become a member. I jumped in the van, and drove into the city. I was starved. I was contemplating a McDonald’s run, but feared I would be late. This was a good call, since there was traffic on the highway. So I blasted loud music and enjoyed my drive into the city, yes, with a minivan. uggh. I made it to the office just in time to shove some graham crackers in my mouth and then start at 10 AM conference call with a Director and another new member to one of our forums. I lead the meeting and focused more on how this particular person could help us drive additional members. I’m in sales mode. He has contacts at great companies and he is really easy to collaborate with – I’m enjoying working with him to build this forum and grow it to something much bigger than it currently is…. I grabbed lunch. Grilled cheese. Comfort food. I’m starved and it is cold outside. We then had our client meeting. We’ve done good work for them, but this is a kind of project where you just want to shake some sense into your client. Their business idea doesn’t make sense given the risk and reward and they are very naive about some obvious aspects of the business. So I’m hoping things go well with them, but we’ve raised the issues so we’ve done what we can do to provide our advice. I did some admin items afterwards and then headed home. I picked up take out dinner (BBQ) and picked up the Twins. Dinner was BBQ. It was delicious. Kids ate well. 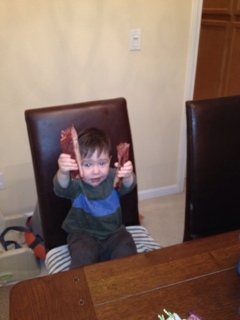 Twin Husky was eating ribs like they were going out of style and I was calling them “dinosaur bones”. He is such a boy. Almost reminds me of a pint-sized man. 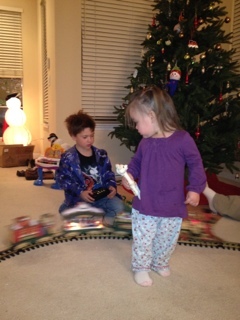 After dinner, Hubby took out a “Santa train” that essentially goes around the Christmas tree. All kids were going nuts. Twin Crazy wanted to dance with me to the Chrismas music. Big Bro was all over the tracks, the trains, and the controls. He was observing everything and figured out why the train wouldn’t work at any given time. He loved controlling the thing. Red was being such a big sister/mother to Twin Husky and to Twin Crazy. It was really too cute to witness. She was instructing them on where to sit (far away from the tracks) and how it works, and hugging them and holding their hands. It really was too much for me to watch. 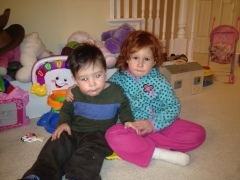 They are so sweet with each other it is almost crazy. Bedtime with the Twins was great. They grabbed their animals/blankets and walked upstairs, blew kisses to folks below, brushed teeth, read books, sang a song, and willingly went to bed in their cribs. Bedtime for the older ones were a different story. Whining, crying, defiance, more crying, etc. etc. I finally had to leave. I said I would not read books if they did not cooperate. I gave them a chance to cooperate. They did not. So I left. I left Hubby up there dealing with two cranky crazy kids because I want to teach them to understand that I follow through with what I say. If they don’t follow instructions and are defiant even if I’m trying to understand the issue, I warn them what will happen and then I need to follow through. So I left. They’re quiet now so I guess they were just super-tired. I had two glasses of wine tonight. I am not working tomorrow. I may take the Twins to the doctor if they have room in their schedule for us. If not, I want to take them to a museum. I’m sure I’ll figure something out over a big pot of coffee….